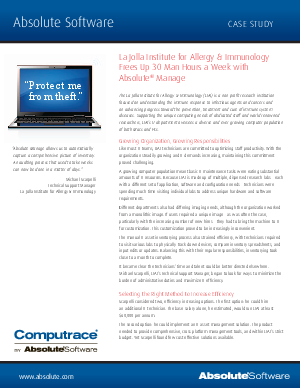 Like most IT teams, LIAI technicians are committed to optimizing staff productivity. With the organization steadily growing and IT demands increasing, maintaining this commitment proved challenging. A growing computer population meant basic IT maintenance tasks were eating substantial amounts of IT resources. Because LIAI is made up of multiple, dispersed research labs - each with a different set of application, software and configuration needs - technicians were spending much time visiting individual labs to address unique hardware and software requirements. Different departments also had differing imaging needs, although the organization worked from a monolithic image. If users required a unique image - as was often the case, particularly with the increasing number of new hires - they had to bring the machine to IT for customization. This customization proved to be increasingly inconvenient.